I mentioned in my BWYF Retrospective about the origin of these brownies and how they were originally supposed to be banana brownies. However, what I didn't mention was that I was an ounce short of being able to make the banana brownies anyways. Either I would have had to open a new bag of chocolate chips or fudge (haha) it by using unsweetened chocolate. However, when my craving for malted chocolate began I discovered a Martha Stewart recipe for malted brownies that, when halved, would use the exact amount of semi-sweet I had on hand. When the universe wants something as much as I do, I try not to argue :). I haven't made a lot of malted milk recipes, but I have bookmarked quite a few. There is a constant theme in everyone of them to add Maltesers (or Whoppers) to the batter in order to enhance the malted flavour. I think this is because what we really want is for every malted chocolate baked good to taste like Maltesers. However, in my mind this is kind of like cheating and I wasn't really keen on doing it. Not to mention that I wasn't going to leave the house to buy bags of Maltesers (you need at least two, one for you, one for the recipe). So in an attempt to get as much malted flavour as possible with out needing to add Maltesers, I went to work on some changes. First things first (that is such a weird phrase, when else would you do the first things? ), more malted milk powder, which I doubled, then reduced the flour to compensate. I slightly reduced the sugar and used both white and brown as I have found this combination to be key in good brownies. Once again, with no half eggs on hand, I used two full eggs. Besides, more egg yolk would give a fudgier texture, which is the goal of all my brownies, and also why I removed the leavening. Now, to me, brownies should never be that much work, which was why I was shocked to read the steps for the Martha Stewart recipe. There was no way I was going to wake up my mixer for a batch of brownies (she was sleeping so nicely in her cozy). Besides, the Martha Stewart version was more likely to produce a taller cakier version of the brownies. If I wanted cake, I'd bake cake. So I ignored Martha, and went with my usual process. The batter that this recipe produced was so strange. To me it was kind of similar to a shiny-chocolate bread dough. And like Homer on a treadmill it was "almost hypnotic." It honestly just glouped right out of the bowl and into the pan. No sticking, no messes, no anything. Never having had a brownie that did this, I was both intrigued and nervous at the outcome. But as it came out of the oven the brownie looked and smelled fantastic. I was excited to try it but put it out of my mind, I needed to work on my apple pie. I knew something was different the moment I began to cut into the brownies. There was something just a little strange about how the knife sliced through them. They looked insanely fudgy, almost underdone, but that couldn't have been any farther from the truth. They were perfectly done, with a crispy top, and a super chewy, almost soft caramel like texture. They got stuck in your teeth and everything. The flavour was malty, chocolatey, and not too sweet (I like my brownies on the semi to bittersweet side). You don't get hit over the head with any one flavour but the combination is really good. On day two, the chocolate flavour was more pronounced, giving the brownies a much more decadent and rich flavour, though the malt was still very much present it didn't have the impact of the night before. Didn't matter much, because they were pretty great overall. 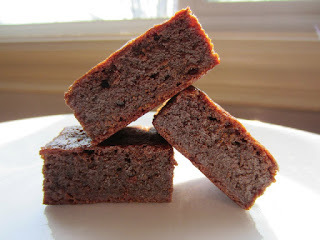 Although I really enjoyed the flavours of this brownie, what really had me mesmerized was the unusual (for me) texture. 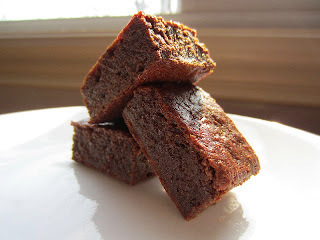 The typical Adam brownie is melty-fudgy, so I haven't had a truly chewy brownie in quite some time. I kind of forgot how much I enjoyed them. I'm also quite curious about how these brownies would taste with milk chocolate. When it comes to baking things with chocolate and malted milk powder, I seem to forget that Maltesers are made with milk chocolate. It's no wonder it never tastes the same. Though, sometimes it's nice to not have everything taste like chicken :). In a medium bowl whisk together malted milk powder, flour, and salt. When the chocolate is luke warm, add both sugars and stir until completely combined. Add eggs one at a time, stirring until combined. Add vanilla and stir until combined. Add dry ingredients to chocolate mixture and stir until no streaks remain. Pour batter into prepared pan and bake for 25-30 minutes or until toothpick comes out clean or with a few moist crumbs (this took me 30 minutes). Remember: a slightly underdone brownie is better than a slightly overdone brownie :). Awesome post! Especially the last line! I so agree that there is no single, perfect way to enjoy any type of food--people who ONLY eat one kind of condiment, only like one kind of cheese, only like chocolate chip cookies...I don't get that. I do, however, completely agree with your assessment of cakey brownies (have cake or have a brownie, what's the point)? Those look wonderfully dense and rich, and I think you've adapted the original enough to call this recipe your own! They look absolutely perfect--and they cut beautifully, which would make them great to give as a gift (some brownies are delicious, but the crackly top tends to flake when you cut them). I was never that into Whoppers (I'm not sure if I had Maltesers while I was in the UK), but I have many fond memories of Ovaltine as a kid. Thanks Mary. There are a bunch of recipes around here where I've just gone nuts and changed pretty much everything :). I often wonder when exactly constitutes a recipe as "your own." I mean even when you create something without a reference you're still using established proportions and the like. I have always loved Maltesers (which are beter than Whoppers in my opinion). I've never actually had Ovaltine, for these recipes I'm using Horlicks Malted Milk Powder :).